Matthaios Simos – Anafiot dragoman extraordinaire! 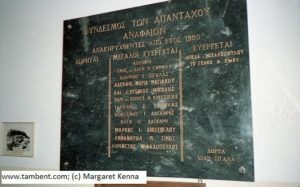 The plaque in the Anafiot Association of Athens in the 1950s, recording the Simos family as benefactors (courtesy of Margaret Kenna). A superficially unremarkable photograph sent in recently by Anafi specialist Prof. Margaret Kenna contains a remarkable clue. The clue is a family name – Simos – on a plaque commemorating benefactors to the Association of Anafi Islanders (Greek Cyclades) in the early 1950s: a relatively prosperous family, thanks to one Matthaios Simos. In his nineties, the Bents’ Greek friend and dragomános, Matthaios Simos, from the Cycladic island of Anafi. He sits (Athens (?) in the 1930s (?)) with a cat between two of his granddaughters – Maria (left) and Irini (photograph © Andreas Michalopoulos 2010). There is an archetype waiting for psychoanalysts to explore – the dragoman, the person you employ to facilitate your travel in foreign lands. Wiktionary helps here (if you want more, you are on your own): ‘From Middle English dragman, borrowed from Old French drugeman, from Medieval Latin dragumannus, from Byzantine Greek δραγομάνος (dragomános), from Arabic تُرْجُمَان‎ (turjumān, “translator, interpreter”)’. What type you get depends on your luck – from an Aristotle to a Zidane – and all travel narratives contain them, none more so than our great 19th-century accounts. And Theodore and Mabel Bent had an extraordinary one: not their first, Kostandinos Verviziotes (for the couple’s 1882/3 visit to Greece and Turkey), nor their second, George Phaedros from Smyrna, who started with the Bents as they left for the Cyclades in the winter of 1883. Theodore and Mabel engaged George on the recommendation of Mr Dennis at the Smyrna consulate. That he was only a moderate success may be inferred by Mabel’s initial lack of enthusiasm when he joins them again, at Ermoupolis, Syros, in December 1883. Apparently he enjoyed a drink, but he was also a grumbler and a terrible sailor – a distinct disadvantage when island-hopping, out of season, on small ﬁshing boats. By Naxos, a few weeks later, the Bents had had enough of him, and one day, high up in a mountain village, they ﬁnd themselves sitting in a warm room, and, “When Mr. Konstantinides our host came home he found 10 people drying their clothes, us two and Phaedros, Mr. Swan, and a man called Mantheos, a native of Anaphi who is to show Mr. Swan mines there…” George was dismissed on Naxos in January 1884 – with just five words in Mabel’s notebook: “We left Phaedros at Naxos”. The Bents went on, of course, to explore Anafi a few weeks later. 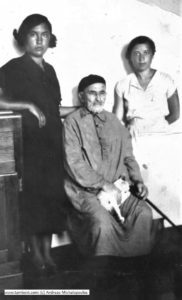 [C/O British Consulate Smyrna 1st February /84] Dear Mr Bent I am happy to learn from your favours of 20th January which I received on the 30th of the same, that both you and Mrs Bent are quite well. I have been always thinking of you how you managed with the continuation of your excursion, and how you got on with the unusual rough winter of this year exposing yourselves so, to the mercy and providence I dare say of God. As regards my passage to Smyrna after we departed, you will please learn that your hopes did not prove as expected for I did not escape of what I was fearing. The wretched steamer ‘Eptanisos’ which took you from Naxos on Monday the 7th of January 1884, did not come back to that island to pick me up for Syra until Wednesday the 9th January, (and about noon) and subsequently she kept going so slow, that I missed the Messageries steamer for Smyrna which was leaving Syra (bound for that town) on the same day. I have been waiting consequently six days in Syra and was obliged to spend almost all the money you gave me at Naxos, (viz: the 100 francs) that is to say in expenses for the Hotel in Syra, in changing my broken and shabby hat, and in paying for my passage or fare ticket to Smyrna which brought me home almost penniless. And my wife had already spent also, what I had sent her from Syra in buying some necessary things for the house, with the cause of the holidays etc. So my friends who expected me to return quite a rich man, contemplating, in their idea and opinion that I was getting £T5 [Turkish pounds] per day in consideration of the winter season travelling, were quite disappointed to ﬁnd that I was obliged and in need to borrow money off them. Mr Dennis also told me that he did not think it was right for me to pay out of my pocket my passage to Syra and back and the expenses for the delay in waiting you in Syra etc., etc. As regards the salary I do not exactly appreciate the opinion of my friends, but I think it is fair that you should make a little allowance for the winter season, that is to say if you do not ﬁnd it so inconvenient, so as to make it worth my while, as I am a fellow with a family as you know. I left Syra on the evening of Monday 14th January. I don’t know where you have spent that fearful evening and night but it was in my destiny to ﬁnd myself in a most violent gale, but fortunately in a brave Arab steamer with Greek captains which was ﬁghting with the elements of the nature that night and stand up like a giant against them. All the plates and glasses are broken and the water found its way in to the cabins. We overtook a steamer called ‘Simiotis’ and saw her bow deeped into the water and we thought she was going to be lost but we learnt that she turned back to Tinos. We kept up but we suffered until we faced the Bay of Smyrna. The impression of that night is still very brisk in my memory. But the necessity of a man is superior to the impression of fear. Although I foresee still bad weather going to be, I made up my mind to come and accompany you again and to be at Syra on the 16th February with the hopes that we shall ahoy the caïques and you will pay for my passage, etc. Please send through Mr. Binney some money for my travelling expenses, etc., enabling me thus to make my start. With my best regards to Mrs. Bent and Mr. Swan. I remain yours sincerely… George Phaedros. This proved a letter in a bottle however and no reply to him is referenced. Within a few days of Phaedros’ abandonment, a whiskery Ariadne on Naxos, and Matthaios Simos (Mabel Bent spells him a multitude of ways over the next ﬁfteen years, but ‘Manthaios’, awkwardly, seems to predominate) gets the top job as dragoman for the Bents, and begins a partnership – friendship really – with Theodore and Mabel that continues until 1897 and Theodore’s death. 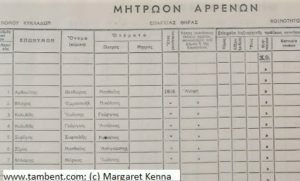 Missing only two or three seasons, Theodore (using the English telegraph station at Ermoupolis to reach him) wires Matthaios from London that he might be, on such and such a date, at Syros, or Rhodes, or Chios, or Alexandria, or Port Said, or wherever, to act as their translator, guide, cook, lodgings ofﬁcer, victualler, foreman and general factotum. This small and wiry islander, who waited to marry until he had finished his career with the Bents, having by then sufficient resources, ‘plusios’ even, and a good catch. (As was the case with so many young Greeks who ventured far afield to escape difficult conditions back home.) Matthaios left his footprints in the sands of Southern Arabia, Sudan, Ethiopia, Egypt, Socotra, Yemen, as well as all around the Aegean. A modern registry listing of the birth (1846, no. 6) of Matthaios Simos on Anafi (courtesy of Margaret Kenna). 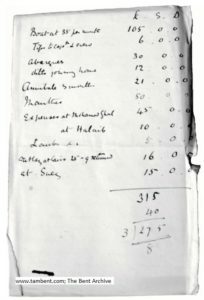 Theodore Bent’s own reckoning of expedition costs to the Sudan in 1896, showing Matthaios’ payment at line 6 (The Bent Archive). 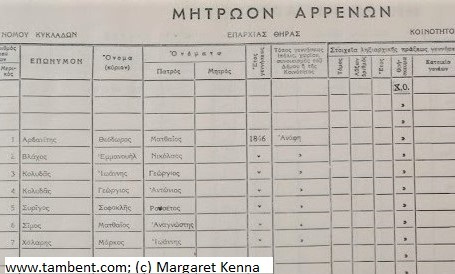 In the Community ofﬁces of Anaﬁ, two hours’ ferry ride away and a little southeast of Santorini, the early registers of births (men only) record the arrival of Matthaios in 1846, son of a subsistence farmer, like nearly every other child. 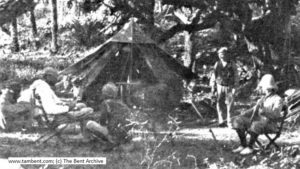 The chance that led him to Naxos and a meeting with the Bents in 1884, aged nearly forty, alters his life (there is a later reference by Theodore that he might have had a tobacco shop on the island as a younger man). In Mabel’s 1897 ‘Chronicle’, the year of her husband’s death, there is a list of travel costs payable, in Theodore’s hand. 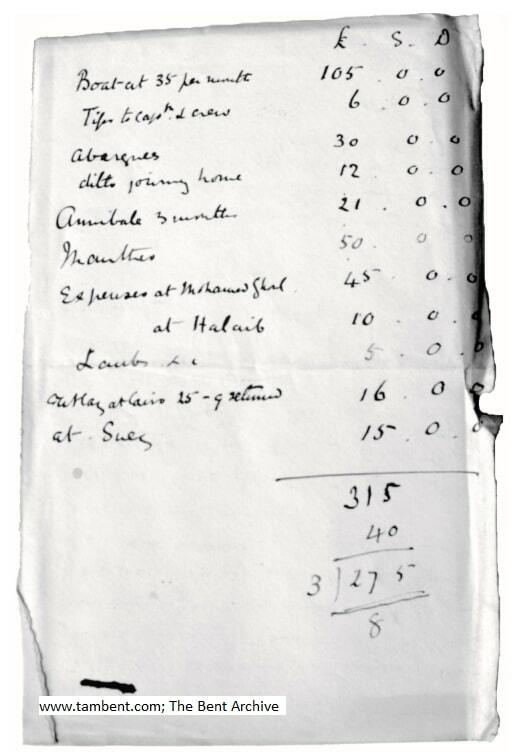 Matthaios’ wages for the trip to Socotra and Aden are £50, about £5000 today, and a huge sum for a Cycladic farmer at the turn of the 19th century; he is able to effectively retire to Anaﬁ, marry, have a family (his descendants are now in Athens and no Simoses remain on the island), and tell of his adventures in foreign lands as dragoman and friend to an extraordinary English couple. He died in the mid-1930s, ﬁve years after Mabel’s death. At camp on Socotra: Matthaios Simos, background, with Theodore Bent, assistant Ammar, and Ernest Bennett. 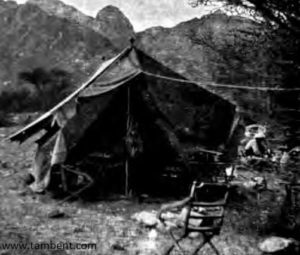 From Theodore and Mabel Bent ‘Southern Arabia’ (1900), facing page 365. Private collection. Early 1896, Matthaios Simos at his chores, behind a tent (right) in the Elba Mountains, Sudan (photo by Mabel Bent, from the Bents’ ‘Southern Arabia’, 1900, opp. page 304). And the same, of course, must be said of the dragomános extraordinaire, Matthaios Simos, of Anafi in the Cyclades, and all points south-east! Mabel Bent and Matthaios Simos on their camels near Mohammad Gul, Sudan (1896, detail). From a photograph (February 1896) by Alfred Cholmley. Glass lantern slide (detail), LS/217-10. 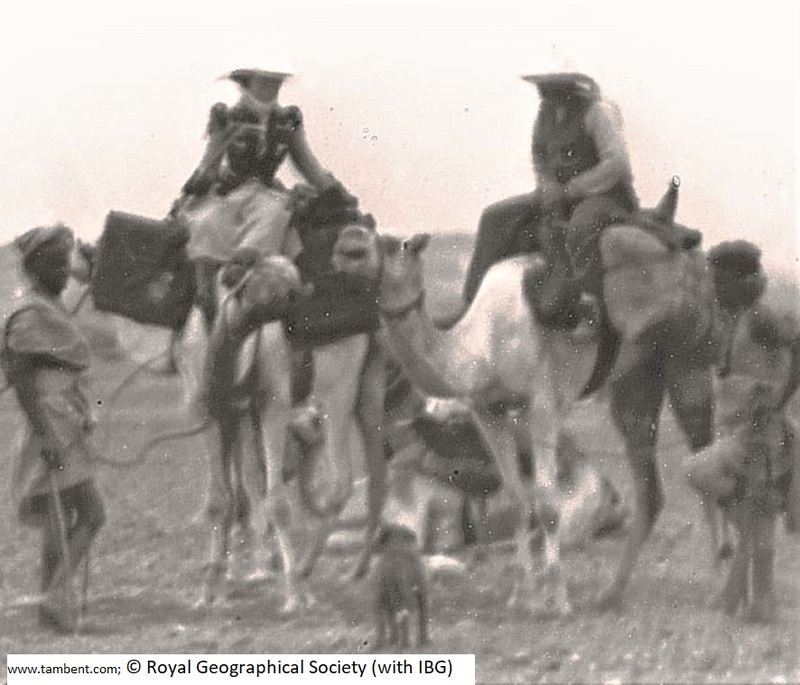 © Royal Geographical Society (with IBG). What a fantastic piece about ‘The Third Bent’! I wonder whether Theodore and Mabel would have survived the Samos pirates, and gone on to even greater exploits, had that chance meeting in Naxos not occurred.